As the name suggests, a massive heart attack is the most severe form of heart attack one can experience. The symptoms may be so great that victims may become unconscious, suffer permanent heat damage, or simply drop dead on the spot. Heart attacks, in general, are a serious health issue. The medical term for a heart attack is myocardial infarction, which means that the heart tissue experienced cell death due to lack of blood supply. If a large portion of heart muscle dies, this is referred to as a massive heart attack. Heart attacks strike nearly 600,000 people each year, with the survival rate of these individuals not being so great, with massive heart attack survival rates estimated at less than six percent. Heart attacks, also known as cardiac arrest, are considered the third leading cause of death in the U.S. behind cancer and heart disease. Massive Heart Attack vs Heart Attack: What Is the Difference? You may not think there is a difference between a heart attack and a massive heart attack, but the two are distinct. A mild heart attack affects a smaller area of the heart and typically doesn’t lead to too much permanent damage. Regardless, even a mild heart attack is still a medical emergency and without proper treatment, there is a higher risk of a more serious heart attack occurring in the future. A massive heart attack affects a larger portion of the heart, contributing to greater damage. A massive heart attack can lead to collapse, cardiac arrest, rapid death, or permanent heart damage. Symptoms in both types of heart attack include coughing, nausea, vomiting, chest pain, dizziness, shortness of breath, restlessness, feeling clammy and sweaty, and shortness of breath. Atherosclerosis: Considered the main cause of heart attacks, leading to a condition called coronary artery disease. Atherosclerosis leads arteries to become blocked due to an accumulation of cholesterol plaques that accumulate and line the blood vessels. When significant plaque accumulation does occur, especially in the blood vessels that supply the heart muscles, blood cannot circulate efficiently due to impaired expansion and contraction of the blood vessels. The most worrisome issue, however, is the sudden formation of a thrombus or blood clot at atherosclerotic choke points. When this occurs in the heart vessels, a heart attack will shortly ensue. Coronary artery spasms: A sudden and transient narrowing of the arteries of the heart called coronary artery spasm can cause an obstruction of blood flow. When this occurs, it deprives the tissues that it normally supplies from oxygen-rich blood. Spasms tend to occur in arteries that have already hardened or arteries with accumulating plaque buildup. Artery spasms can be felt as chest pain and tightness under the sternum or on the left side of the chest. Spasms may be triggered by high blood pressure or high cholesterol states. Emotional stress, alcohol withdrawal, and exposure to cold environments are also known causes. Coronary microvascular disease: A disease of the small arteries in the body leading to their damage. Like atherosclerosis, this condition is commonly found in those with high cholesterol levels as well as those with high blood sugar, high blood pressure, and those who smoke. Sedentary lifestyles and obesity are also risk factors. Chest pain is a cardinal symptom of a massive heart attack. Severe and excruciating chest pain which can radiate to the left arm, jaws, back, and neck. Limbs feeling cold and clammy. Irregular pulse and heart beat with low blood pressure. Time is of the essence when dealing with a massive heart attack. The more time that is taken before the initiation of treatment, the higher the chance of death. Getting to the emergency room within the first couple of hours will give you the best chance of survival when suffering from a massive heart attack. Overall survival rates will depend on the extent of damage to cardiac tissue, how fast treatment can be given to the patient, and if the patient has any pre-existing conditions that affect overall survival rates. When arriving at the emergency department, one of the first things to be done is hooking you up to an electrocardiogram (ECG). It is the main diagnostic tool used for all cases of heart attack. ECG records electrical responses of the heart and outputs them in the form of a wave graph. Impaired heart muscles have difficulty conducting electrical waves and can easily be interpreted on an ECG graph. Along with symptom presentation, an ECG is a great tool to use when diagnosing any sort of problem with heart function. Another test that will be done to provide evidence of a heart attack is a blood test to look for specific cardiac markers. During a heart attack, certain enzymes are released into the blood stream because of tissue damage. These enzymes can be detected, helping to confirm a heart attack has occurred. The patient will be given a sub-lingual aspirin to prevent further clotting of the blood. If necessary, nitroglycerine will be provided if there is chest pain. Oxygen will also be provided. Morphine or another pain killer may be utilized as well. If the patient has already fainted, emergency cardiopulmonary resuscitation will be done. The purpose is to maintain blood flow to the brain and other organs. Once any emergency intervention has been taken care of, an ECG will be hooked up to get a better picture of how the heart is functioning. In cases of arrhythmia (irregular heart beating), cardioversion or a defibrillator will be used to help re-sync the heart to a normal rhythm. 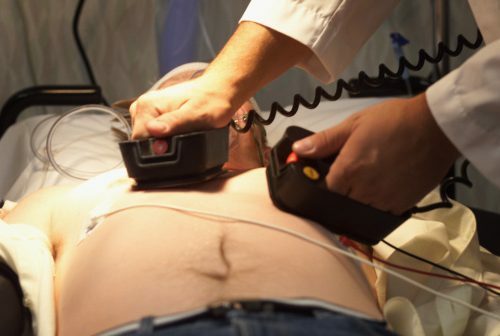 When no heart beat is detected, a combination of CRP and chemical cardioversion will be used. Once the worst has passed and procedures such as angioplasty have been done, cardiac arrest patients will likely be given a combination of thrombolytics, statins, beta-blockers, and ACE inhibitor medications to help reduce any future chance of a repeat heart attack. Stroke vs. heart attack: How do you know if you’re having a stroke or heart attack?